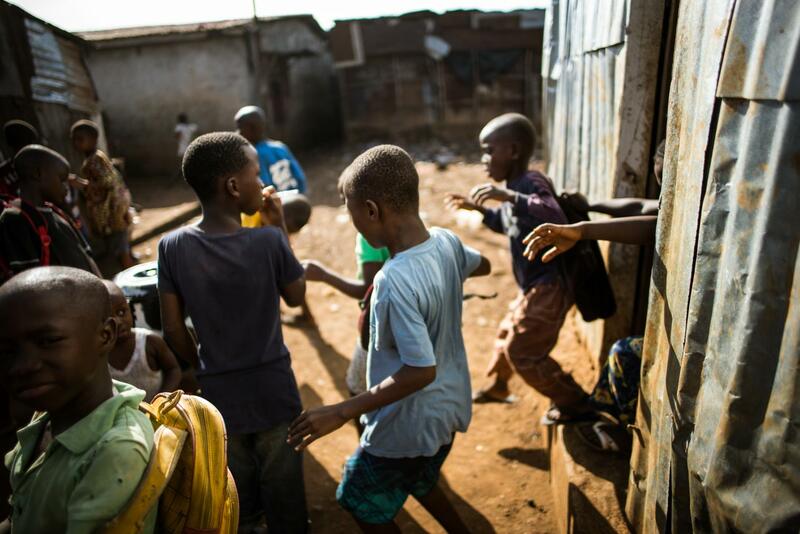 These images were taken in conjunction with Momenta Project Sierra Leone 2015 in Freetown, Sierra Leone. Photo © Sara B. May/Momenta Workshops 2015. 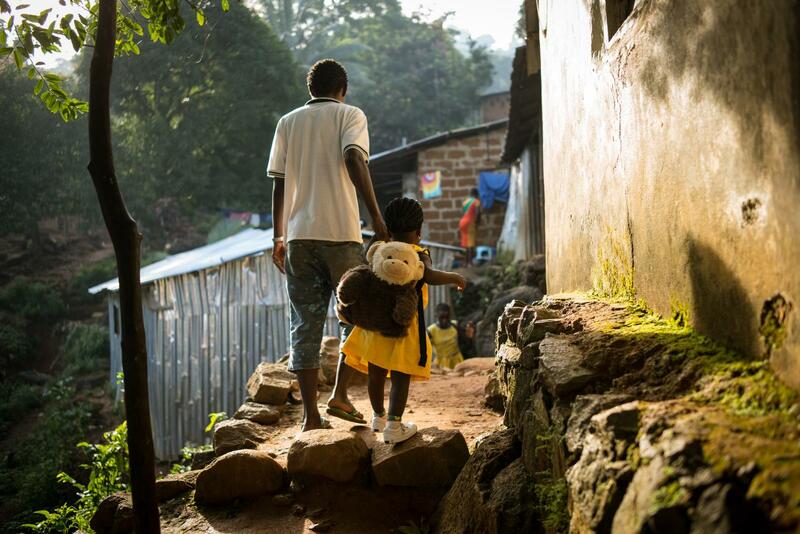 A father walks his daughter to school in the George Brook neighborhood of Freetown, Sierra Leone. Education of the youngest generation of Sierra Leoneans has become the country's cornerstone of hope for recovery moving forward. 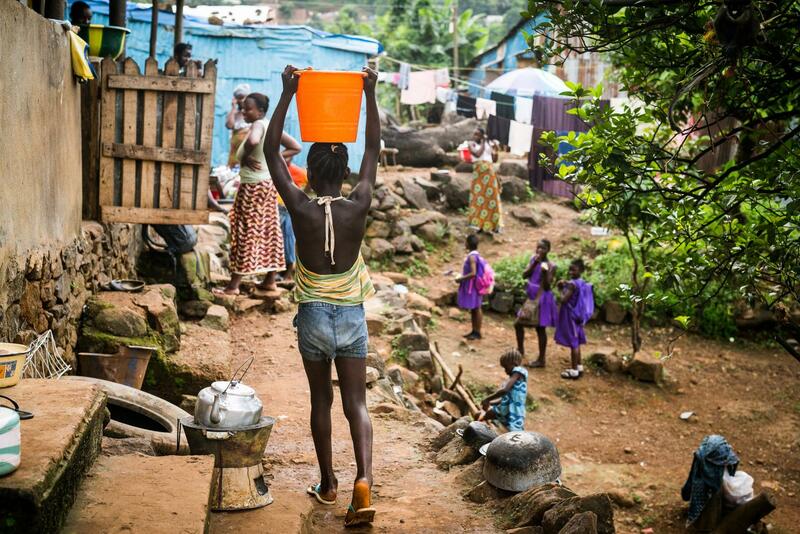 Post-Ebola media coverage has focused upon how international relief efforts could help rebuild the ravaged Sierra Leone economy and healthcare systems. 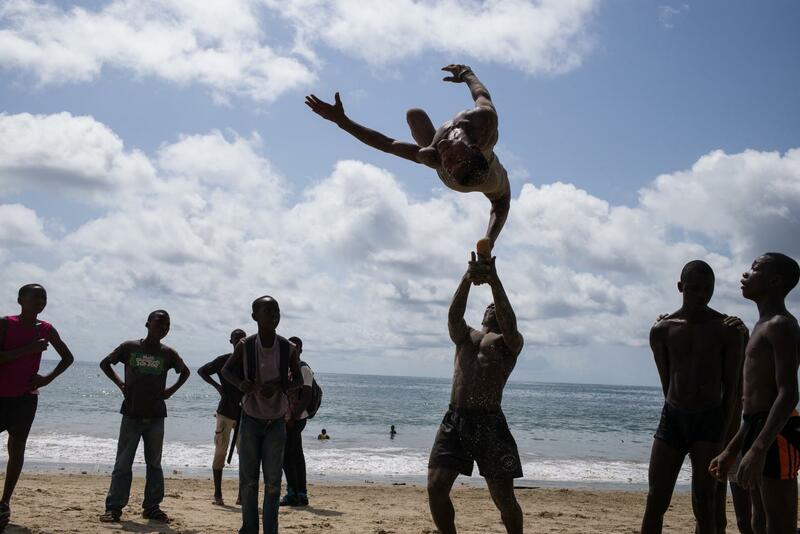 However, the heart of the story remains how Sierra Leoneans are confronting their fears of exposure to regain their sense of place within their communities. For the past 2 years, learning one's ABC's meant complying with public health directives to "Avoid Body Contact". 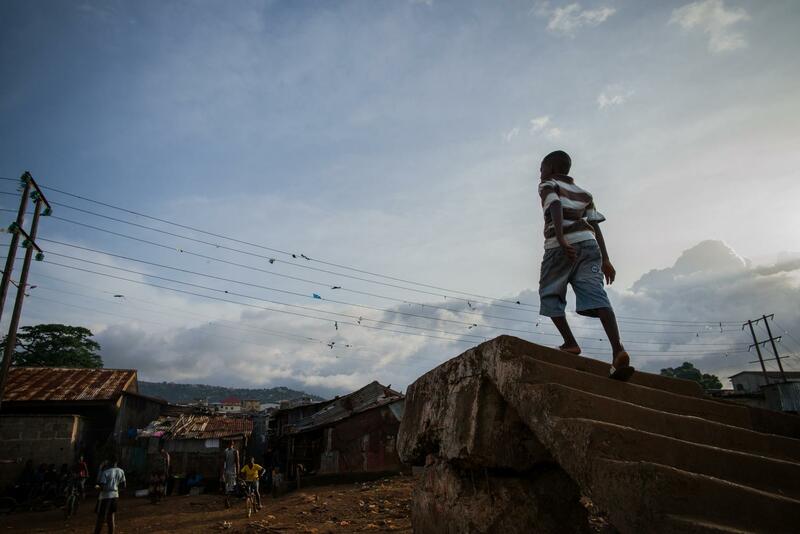 In the aftermath of Ebola, many Sierra Leoneans struggled with lingering fears of crowded public areas. My project examined how the simple acts of re-entering public spaces--visiting friends, hailing a taxi, gathering at the beach, sending your children to school, going to work, navigating human touch—comprise not only a celebration of community, but also a courageous step towards restoring the emotional and communal bonds that have historically defined this country's culture. While the shadow of Ebola will haunt this nation for years to come, the resilience and passion of the people should be at the heart of the coverage moving forward. Primary school students at the We Yone School in the George Brook community eagerly await the start of class. 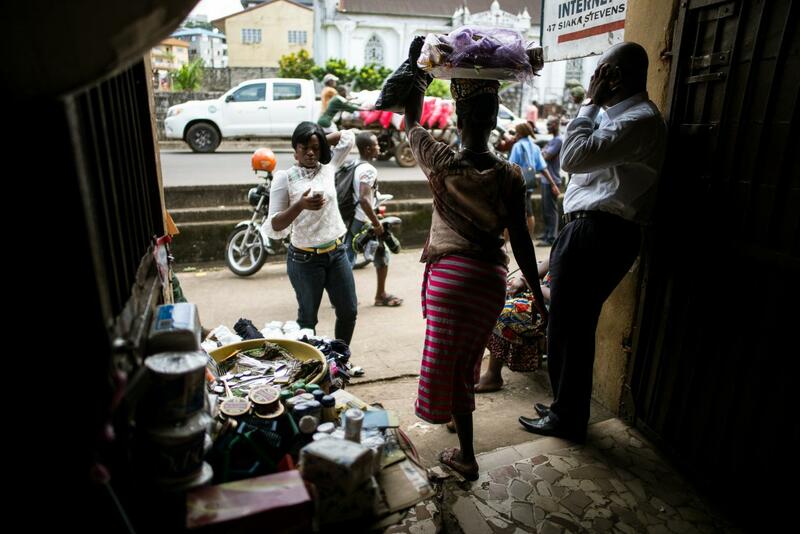 A street vendor exits an internet cafe onto the main thoroughfare of Sierra Leone's capital in Freetown. 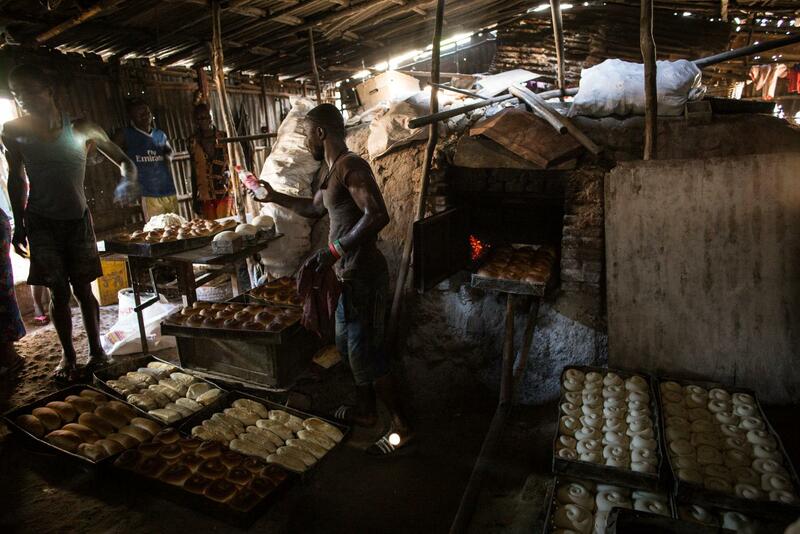 In a bakery in Kroo Bay, workers form a companionable production line as they knead and shape bread that will soon be baked and sold to feed the 15,000 residents of the local community on the shores of Freetown, Sierra Leone. The shaped dough is sorted en route to the oven. 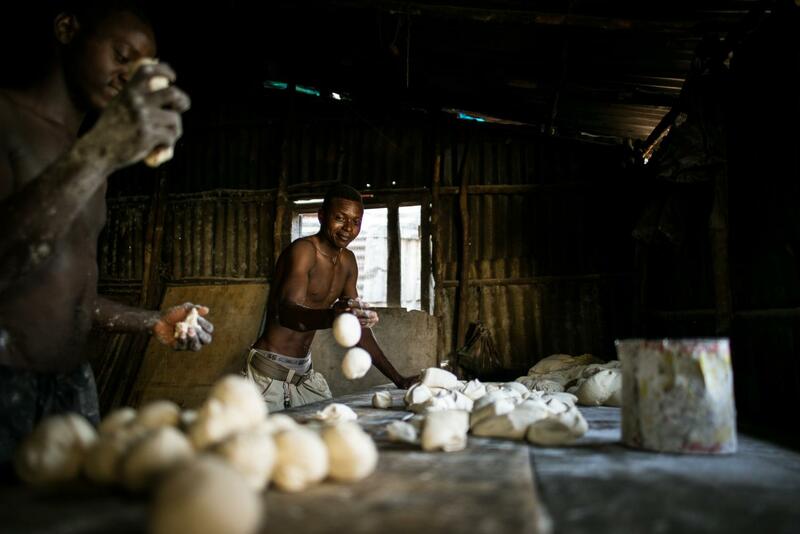 In the bakery, a 12 x 20 foot tin shack, young men work shoulder to shoulder to produce thousands of loaves of bread a day. Students jump rope during recess at the We Yone School in George Brook. 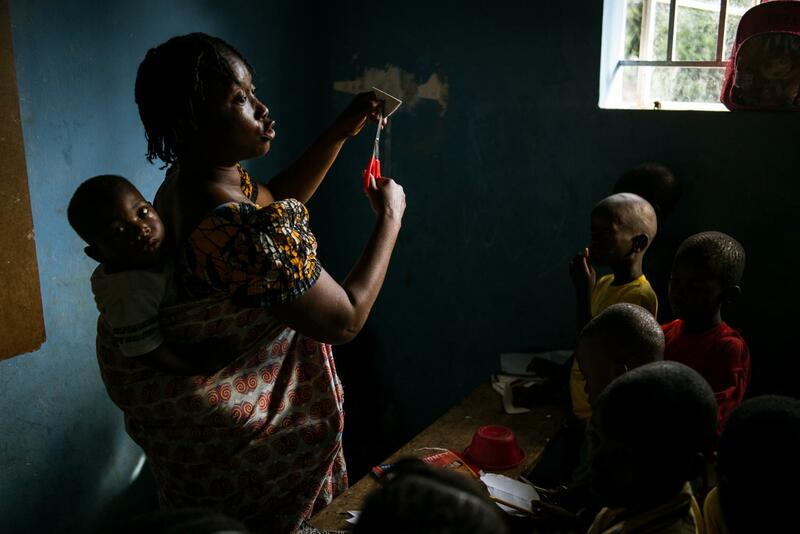 Every day is bring your child to work day for teacher Edna Boyle, who teaches primary school students at the We Yone school in the George Brook neighborhood of Freetown. A student cares for teacher Edna Boyle's 1 year old son while "Auntie Edna" supervises students outside during recess. 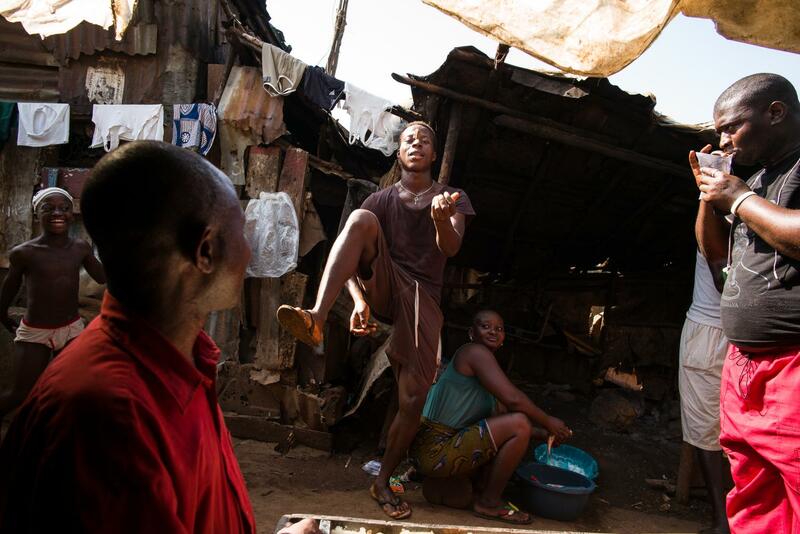 A man entertains his neighbors with a juggling routine in Kroo Bay, Freetown. 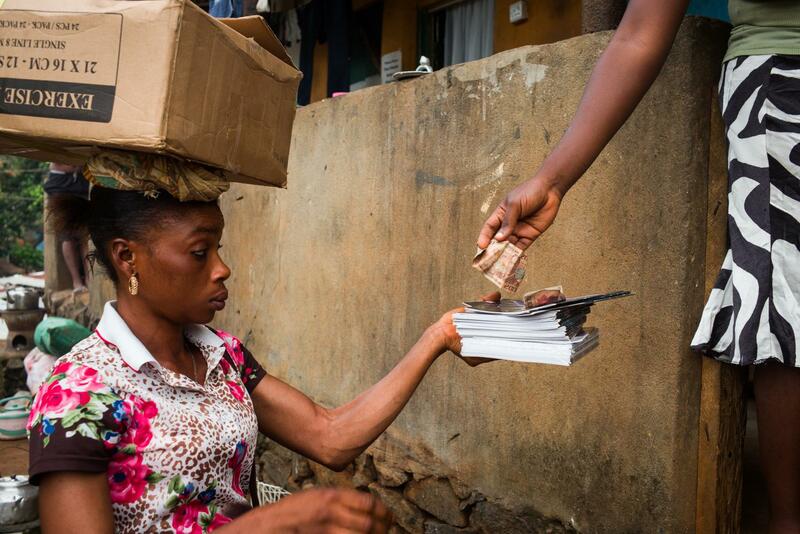 During the Ebola epidemic, door to door commerce ceased to exist. 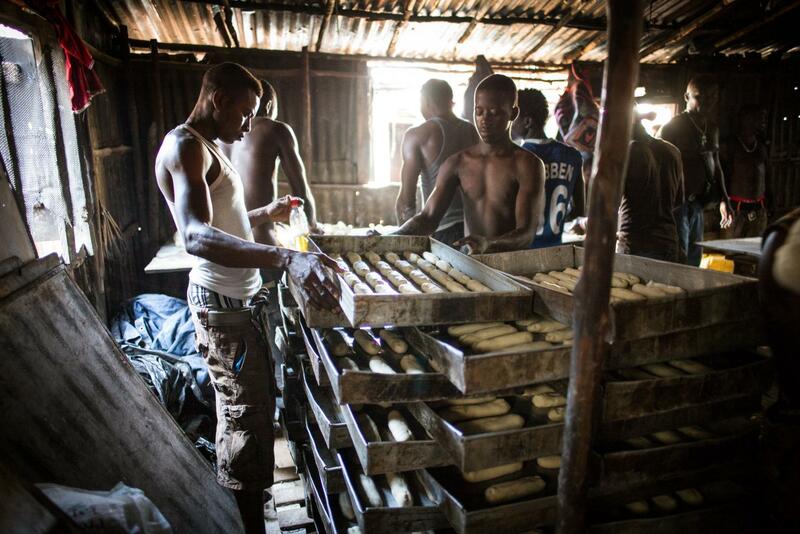 However, with Sierra Leone now Ebola-free, street vendors are venturing again into neighborhoods with their wares. 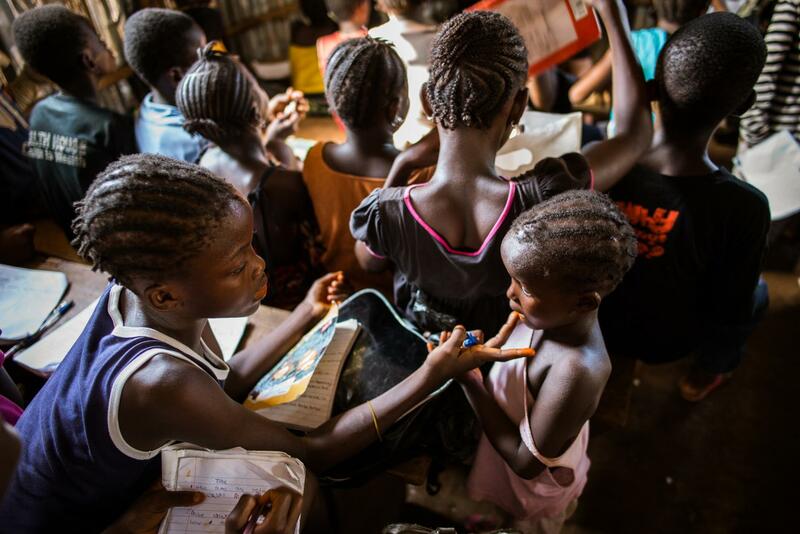 Here, the adoptive mother of a 10 year old girl orphaned by Ebola a year ago purchases a notebook for her daughter's upcoming school exams. 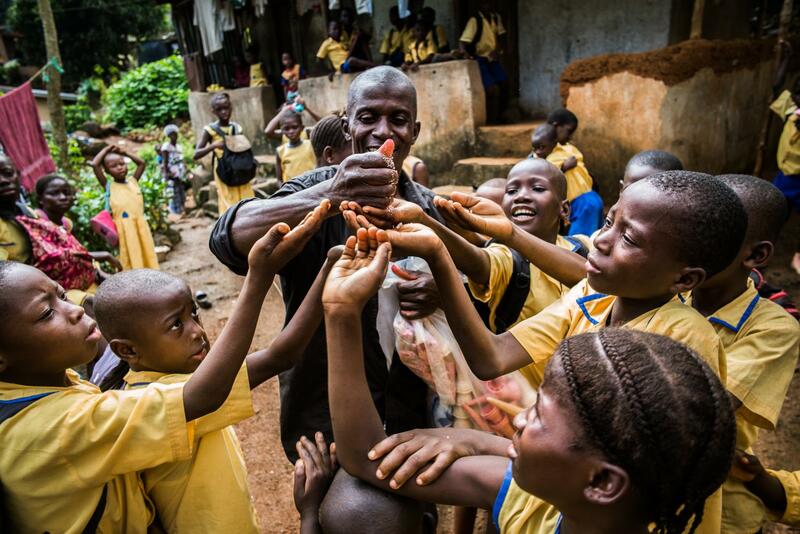 Adama Koroma, a 10 year old girl orphaned by Ebola a year earlier and adopted from her rural village by a family in Freetown, does her after-school chores. 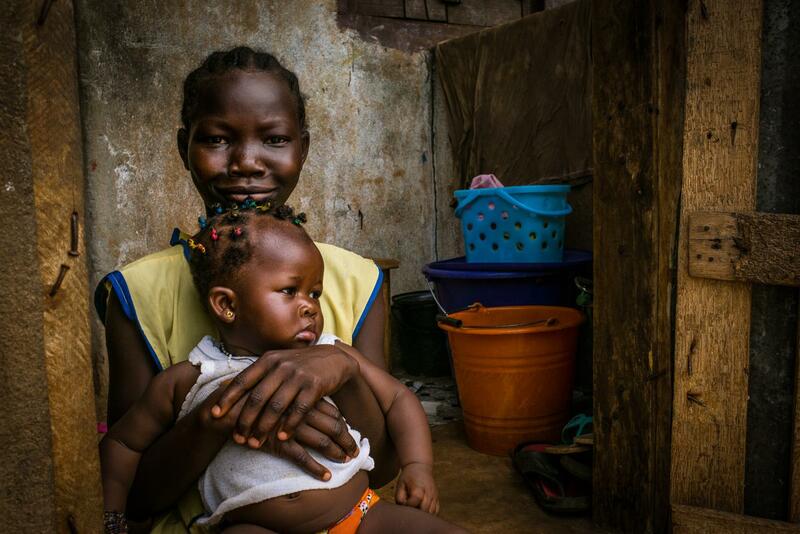 Adama Koroma smiles proudly as she holds her younger sister, born to Adama's adoptive parents 2 months after Adama was adopted. While the okada motorcycle taxi is the cheapest and easiest form of transportation in Sierra Leone, it also comprises the most intimate form of public transport. 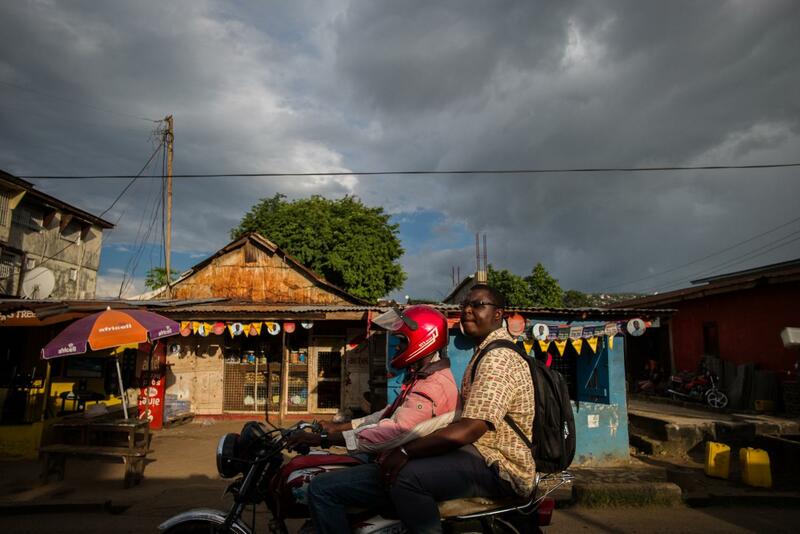 During the Ebola epidemic, many okada drivers became victims of Ebola themselves in the struggle to save the sick, transporting ailing passengers to healthcare facilities. Here, an okada driver ferries a passenger across Freetown at the end of the day on November 2nd, 2015. 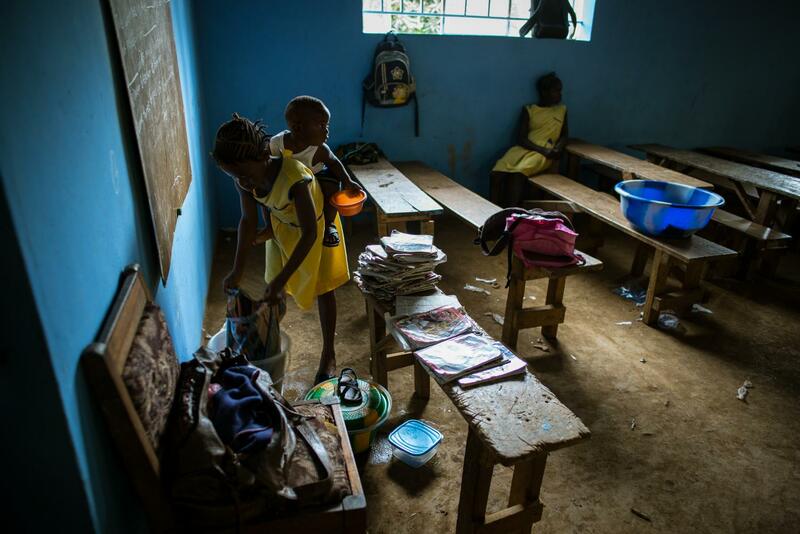 A student shares her flavored sugar packet with a younger classmate at the We Yone school in Kroo Bay, Freetown. 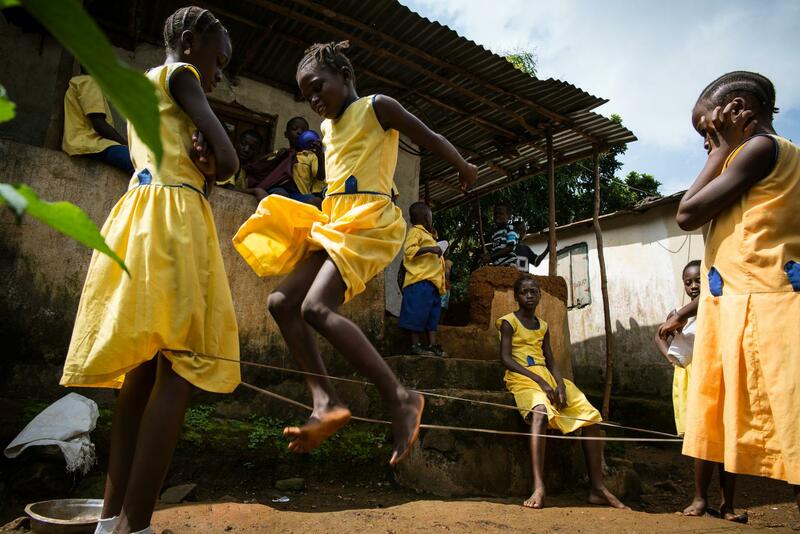 After a 9 month hiatus from school during the height of Ebola, students across Sierra Leone are fervently committed to making up for lost time. 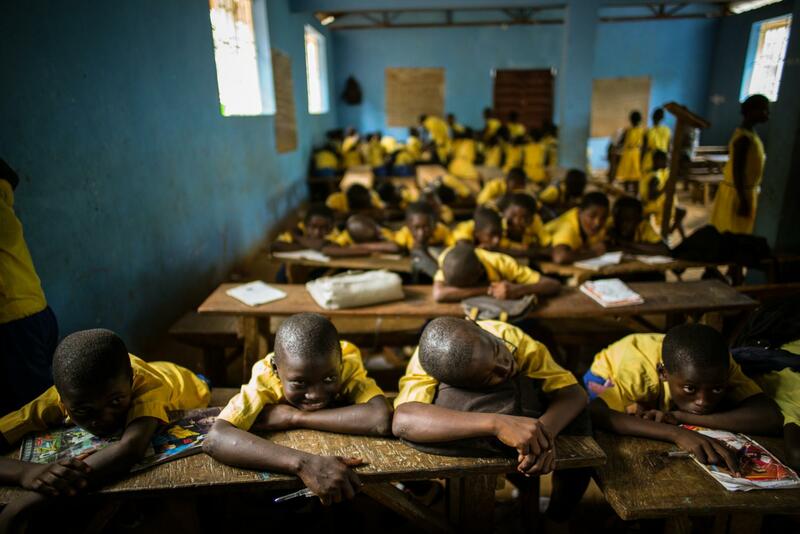 Here, a class participates in an exercise on telling time at the We Yone school in Kroo Bay, Freetown. 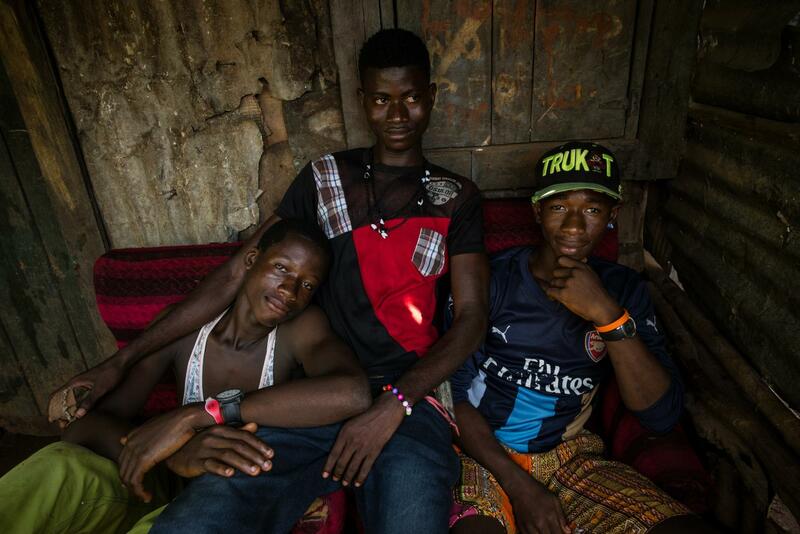 After spending much of their free time during the Ebola epidemic isolated inside their densely packed zinc and wood shanties, a group of friends enjoys oneanother's company at the end of the work day in Kroo Bay. 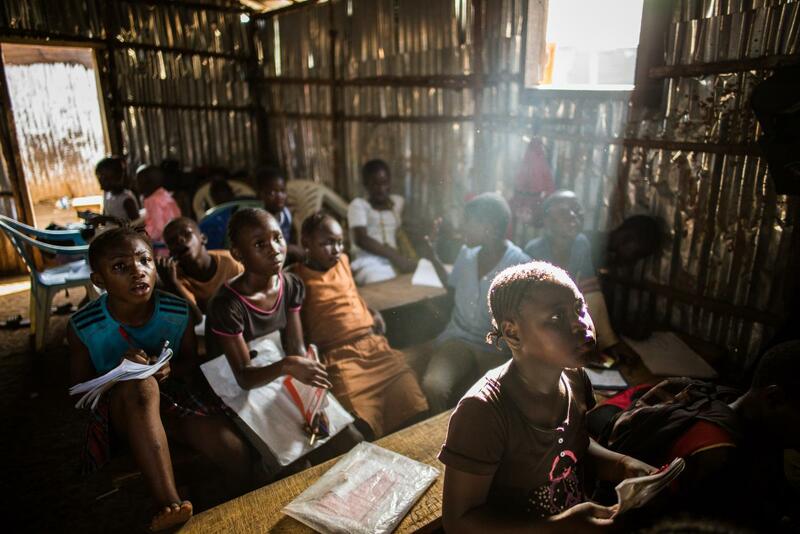 School's out for students at the We Yone school in Kroo Bay. 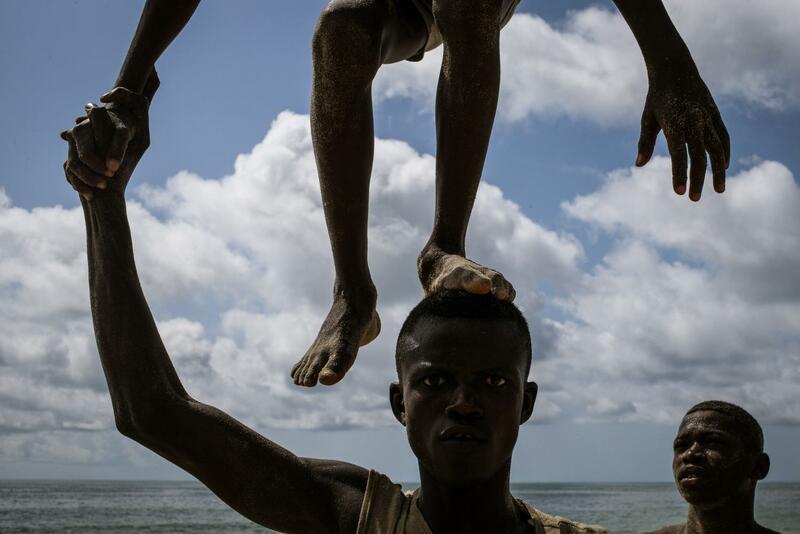 A young boy scales a decrepit bridge spanning the Crocodile River in Kroo Bay on his way home from school. 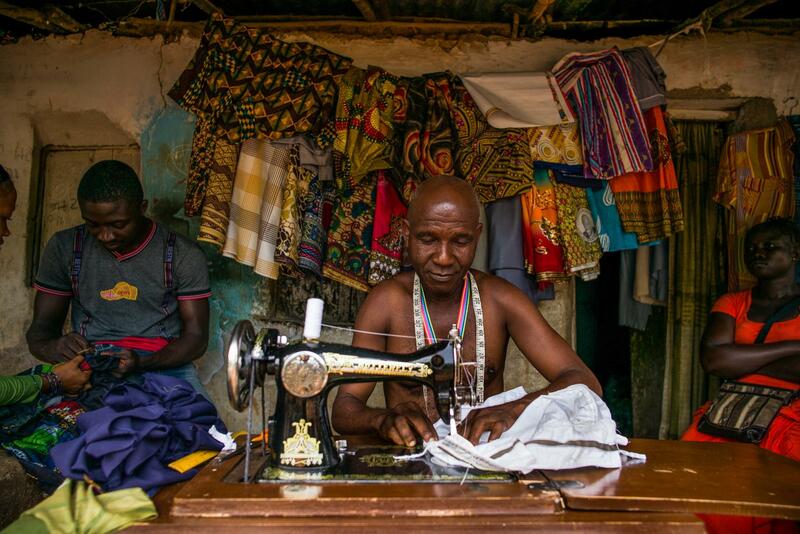 A tailor in the George Brook neighborhood finishes up a job while his assistants confer on a dress design, left, and a customer waits in the shade of the shop's awning, right. 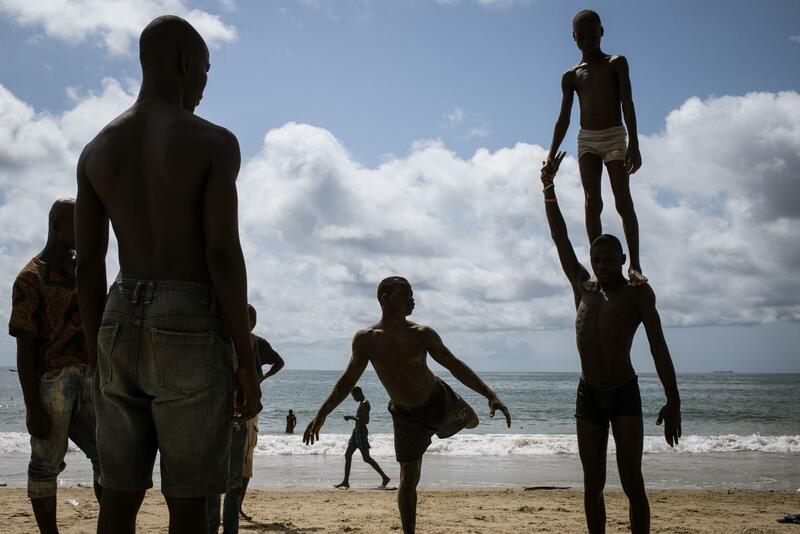 Friends practice gymnastic feats on Lumley Beach in Freetown on "Ebola-Free Day", November 7th, 2015. 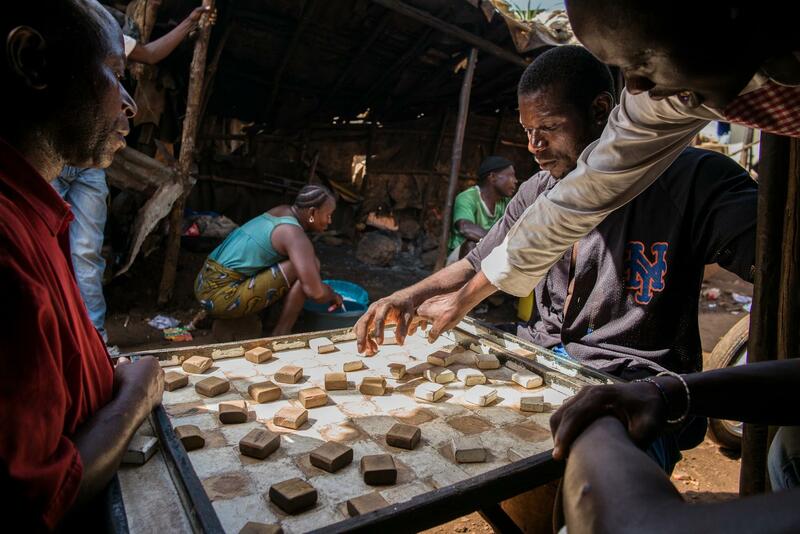 Checkers invariably attracts a crowd, not to mention a never-ending stream of challengers hoping to defeat Pastor Phillip, left, the reigning checkers master of Kroo Bay. Cousins Agnes Kamara, Isatu Kargbo and Rose Johnson, all adopted by their aunt following the loss of their respective parents to a combination of Ebola, Malaria, and Typhoid, bathe together in the public alley behind their home before school. 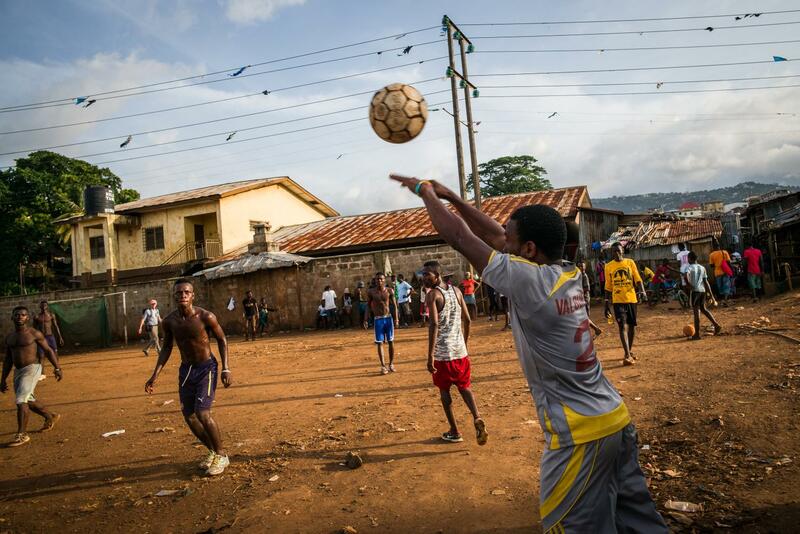 A spirited game of football can now be found underway every evening in the central square of Kroo Bay. 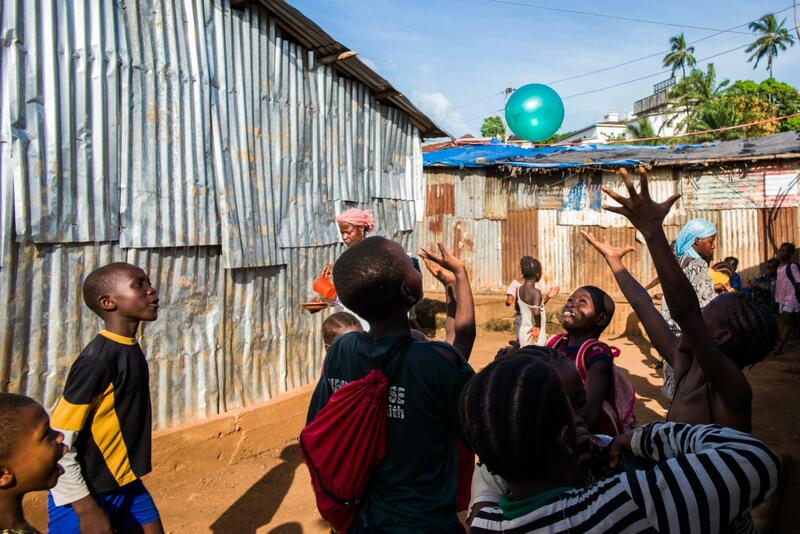 Children in the Kroo Bay community of Freetown play in front of the We Yone School. 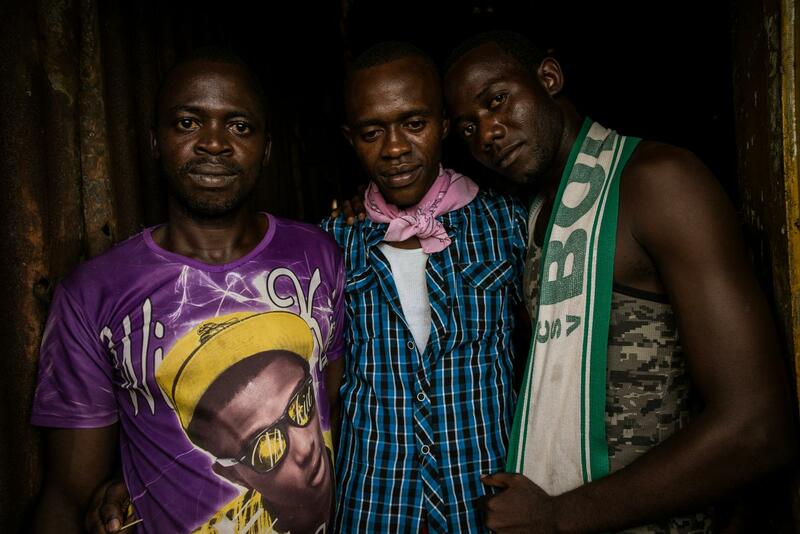 Two brothers flank their best friend, a local tailor in Kroo Bay, in his shop at the end of the day. 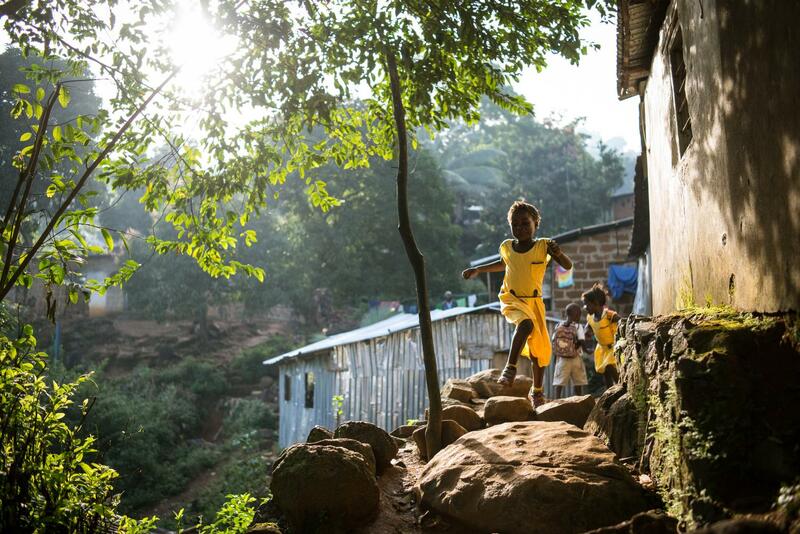 A secondary student runs to her morning class at the We Yone School in George Brook. An ice cream vendor hands out free crumbs to schoolchildren during recess at the We Yone School in George Brook.